IN a month or two when a train rolls out from Anantnag to Rajwanshar, it will be the culmination of one revolution and the beginning of another in the Valley. While the rail network will soon connect different parts of Kashmir, the link with the rest of the country, too, is not a distant dream anymore. When Ircon laid the foundation stone of the Srinagar railway station in 2001, it was not the ambitious thought of laying a 120-km-long track across Kashmir that was on their minds, but fears about the future and the security of the project. The year 2001 was the bloodiest in the state’s recent violent history and the railway project was one common hate factor among the militants. "There was a constant sense of foreboding that we would be forced to stop work under threat," an official recalled. The fear, however, remained just that. Seven years down the line, Ircon has achieved a feat that leaves many surprised by not only the attractive railway stations constructed in the scenic Kashmir valley and the engineering marvel accomplished in difficult terrain but also the conditions under which the project took shape. When Shoaib Alam,a septuagenarian whose land has been acquired for the project in Budgam town, was asked what the rail project (because anything coming from Delhi generates a debate here) meant to him and others, he said philosophically, "Ye alag tarah ki zindagi hogi" (it will be a different life). Kashmir has bitter-sweet memories of its association with the Railways. Alam says it was more than a 100 years ago that a proposal to link Kashmir to Jammu with a railway line was first floated. The, then, Dogra ruler of the state, Maharaja Pratap Singh, had mooted the idea in 1898. But it never took off because of financial as well as political reasons. The British, too, considered providing a rail link between Srinagar and the areas now in Pakistan through Pakistan-occupied Kashmir, but in vain. government and not that of the Railway Ministry. It would have taken the ministry several decades to generate the resources required. The residents of the Valley are quite upbeat about the project as most of the local residents, especially the youth, have hardly seen anything beyond the Jawahar tunnel that connects it to Jammu. For many in the Valley, the excitement of train travel is equivalent to the thrill of a child’s first plane journey. Though there are likely to be more Kashmiris who have flown in planes. 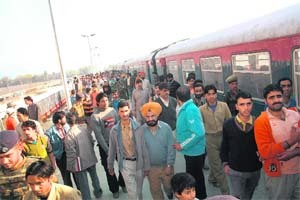 The masses are largely supportive of the rail project as they believe that once the link with Jammu is complete, it would give a boost to trade. "Transporting goods by road is expensive as well as slower. In fact, the rail transport is not as vulnerable to the vagaries of weather as the road traffic," Altaf Sagar, a fruit grower from Sopore, says. Though the security around the tracks is massive and the Railways is likely to deploy a large number of security personnel once the first train chugs off, militants have refrained from targeting the tracks as they fear it may put off the locals, who see the project as a harbinger of prosperity. Nonetheless, the separatists’ propaganda machinery has been in the overdrive, more so in the initial stages of the project, to vilify the Jammu-Kashmir rail link. "The government needs it to send battalions of security personnel in a short time. I have no doubt that this is another occupational tactic," hardliner separatist leader S.A.S. Gilani said in an interview. People may have their political beliefs, but they seem to view the project for what it essentially is — a quick mode of transport, which they have been missing for decades. But security still remains the biggest concern. Mehboob Khan and Atiq Khan, cousins, who run a grocery store in Srinagar, who had gone to see the railway station, had to return disappointed as the security personnel did not let them enter the premises. But it failed to dampen their enthusiasm as they were all praise for the project, "We do not think any person in his right mind would be against the trains coming in here. It will be a huge economic push for us. More tourists will come and business will grow," they add. Normal discourse in the Valley mostly draws sustenance from anti-Delhi rhetoric. The arrival of the Indian Railways in Kashmir was also met with a similar cynicism. A top Ircon official said he was surprised to see a number of reports and commentaries in the media claiming that the project was essentially meant to carry soldiers into and across the Valley. But Ircon decided to work quietly without any publicity that would have attracted unwanted militant attention. The officials, who spoke on condition of anonymity, said they had engaged local contractors for the Rs 1,500-crore project, which proved beneficial. "We normally don’t do so as it keeps away quality contractors. It was especially tough in the Valley as enough expertise is not available here," he said. However, the inclusive work schedule, combined with the willingness of the locals to join in this major developmental project meant that the Ircon’s work proceeded as smoothly as possible. But for a stray incident involving the kidnapping and murder of Sudhir Kumar, one of its engineers, by militants in 2004. One charge that carries some validity is that the project has disturbed the ecological balance of the region. According to National Conference leader Omar Abdullah, a large number of trees had been uprooted due to the project. This had loosened the soil in the countryside which can cause lanslides, especially during the rains and snow. But Ircon officials say they have taken the necessary precautions. "A developmental project as major as ours is bound to upset the existing ecological balance to some extent. But the critics fail to appreciate the enormity of our task," said an official. The single-line train service will connect Qazighund in south Kashmir to Baramula in north Kashmir. The 120-km-track will connect 15 stations and the journey will take anywhere between two and two-and-half hours. According to Ircon officials, due to the scenic view en route, the stretch will be comparable to the Kalka-Shimla and Darjeeling tracks. The trains, however, would not be really trundling in the Valley as they do on these two historical routes. The authorities have already given a nod to a maximum speed of 110 kmph on a number of sections on the stretch. Keeping in view Kashmir’s curvaceous and changing topography, 62 major and 610 minor bridges will dot the tracks and there will be 87 underbridges. The rail coaches used will have a chair-car pattern. The angular shape of engines will give the trains a modern look. As the winter temperature is often harsh here, all coaches will be fitted with heating facilities. Officials have also made special arrangements to keep the tracks clear during heavy snowfall. 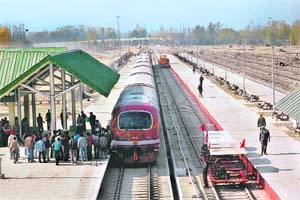 Laying the rail network in the Valley is a relatively small achievement compared to the Herculean task of connecting Kashmir with the rest of the country. As engineers cut through the Pir Panjal mountain range and face the nature’s fury while doing so, they know that they have a monumental task at hand. Nobody knows what lies ahead as the deadline keeps on getting extended, (it is now year 2013), and new challenges crop up. But if the challenge is Herculean, the Railways, too, is confronting it on a massive scale. It has built the world’s highest bridge, at 359 metres, over Chenab river. A senior engineer says, once the network is completed, it will have 855 bridges and 74 tunnels, one of which will be 11-km-long "These are untested waters for us and nobody knows how things will unfold," he adds. Human tragedies are not uncommon as hundreds of men work on dangerous heights using massive machines. Every day when men arrive for work, he says, there is a certain apprehension, along with a sense of thrill and determination to prevail against all odds. But as an artiste would say these are the signs of a great work in making. Unlike the crowded railway stations in northern India, those in the Valley, like the one in Srinagar, will be well-designed and majestic. According to Ircon officials, they have taken special care to keep the natural beauty around the stations intact. And the chief example of this effort is the Srinagar railway station. The five-storey building of Nowgam (name of Srinagar’s railway station), is 8 km from the main city. The station looks like a royal court. The retiring room, with its huge chandeliers and fine woodwork with delicate Kashmiri carvings, is bound to charm the visitors. The extensive use of wood, a hallmark of Kashmiri architecture, can be seen around the rest of the tation as well. The Indian Railway Catering and Tourism Corporation (IRCTC) is planning to build a hotel around here in the next three years.